The actual name of our club is “Bullseye Buccaneers”. It's a name that was picked an awfully long time ago by the young kids in the club. They thought it was cool and it probably was at the time. Even through we still struggle to spell “Buccaneers”, we’ve kept with the name ever since. Our club focusses exclusively on recurve target archery. The head coach is Joan McDonald. As an athlete, she was Canadian Champion 13 times and represented Canada internationally at the Pan American Games and at 8 consecutive world championships earning silver and bronze medals. Since retiring as an athlete, she’s coached at 6 Olympics games and countless other international competitions. In September 2017, she was appointed the System Pathway Coach and tasked with designing and implementing a program to find and train the next generation of archers who will be the national team members of the future. Joan is a Level 4 NCCP certified coach and a Provincial Judge. She is member of the Canadian Olympic Hall of Fame and the 2013 recipient of the Coaching Association of Canada Jack Donohue "Coach of the Year" Award. She was Canada’s National Coach for Recurve Archery for a two year appointment through the Rio Olympics. Additional coaching and instruction is provided by the experienced archers of the club, many of whom are nationally or internationally ranked. 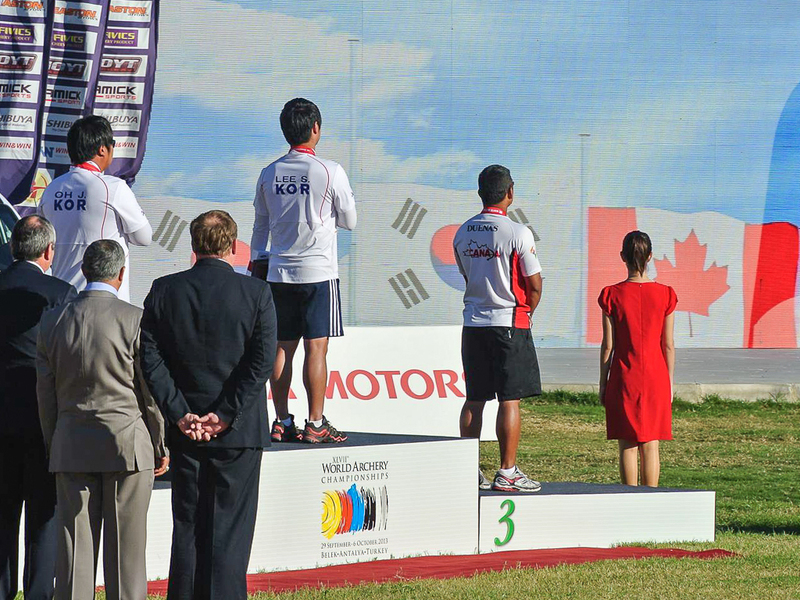 Crispin Duenas receiving his Bronze Medal at the 2013 World Archery Championships.